Enable users to visualise the overall health of builds, delivering a visual cue similar to the Codify Build Light. 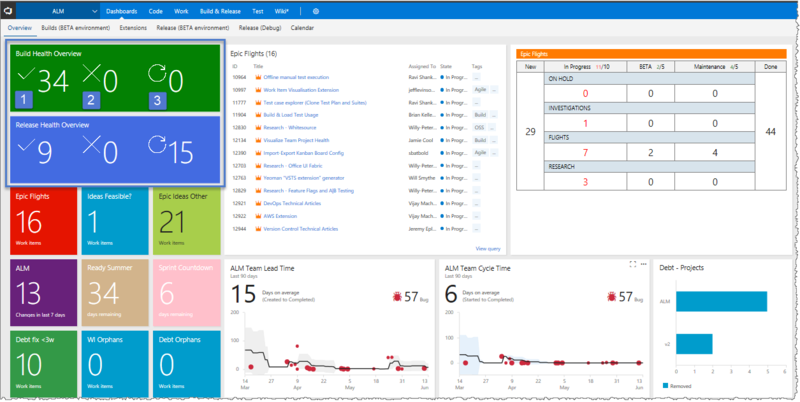 ##Project Health at a glance When you're running multiple CI/CD pipelines, it's invaluable to visualize the overall health of your projects. This extension contains several dashboard widgets, that enable users to create a visual cue on their dashboards, like the Codify Build Light. 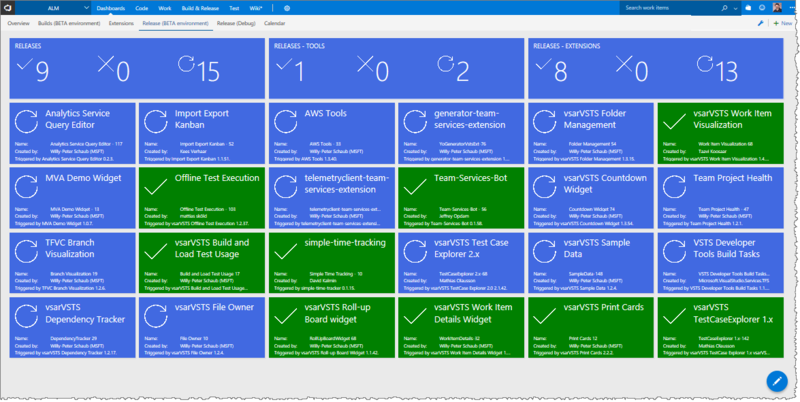 ###Overview Widgets Using the Build Health Overview and Release Health Overview widget you can add an overall status of your builds and releases to your dashboard. As shown, we have (1) thirty-four successful builds, (2) zero failed builds and (3) zero builds in progress. We also have 9 successful releases, zero failed releases, and 15 releases that are in progress. The widgets change its colour to green if everything is healthy, blue if anything is building, and red if anything has failed. 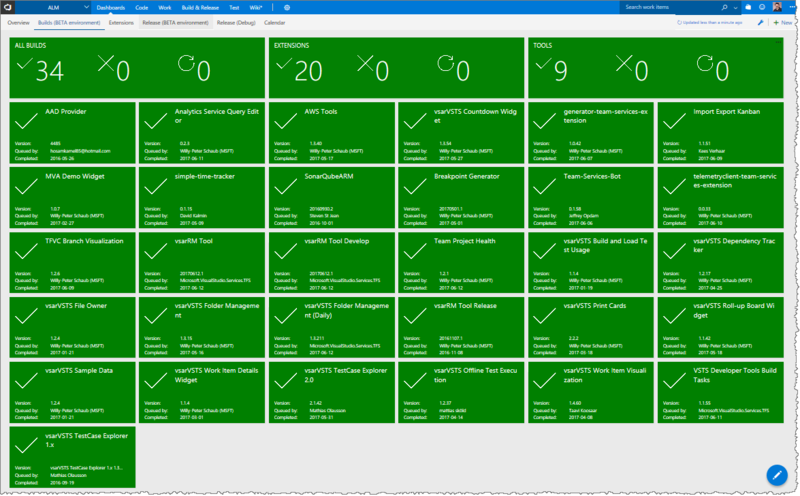 ###Build Details By combining the Build Health Overview and the Build Health Details widgets you can create a build board that shows the same overview status and a detailed status for each build. ###Release Details By combining the Release Health Overview and the Release Health Details widgets you can create a release board that shows the same overview status and a detailed status for each release. As shown, we have 15 releases that are in progress, which changed the colour of the Release Health Overview widget and associated Release Health Details widgets to blue. When you're configuring your release widgets you have an option to handle rejected releases as failed releases. 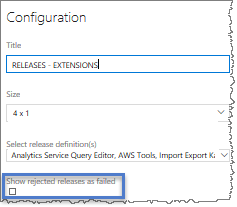 Until a Promise Polyfill hotfix is added to the web platform of TFS on-prem, this extension is not supported with Internet Explorer (IE) 11.0. Only supported from TFS2017 Update 3 or higher, due to new API dependencies. View Notices for third party software included in this extension. We thank the following contributor(s) for this extension: Wouter de Kort, Jakob Ehn, Utkarsh Shigihalli, and Ed Elliott.